DHA sends SNG satellite truck to Mosul, Iraq. 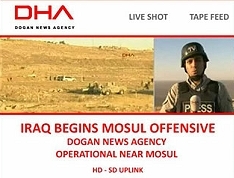 Mosul, October 2016: Dogan News Agency (DHA) has sent live transmission facilities to the Mosul area to cover the Iraqi military operation against ISIS. DHA - which is new to promoting its services on TVZ - is offering live shots and tape playout facilities. The company's SNG uplinking team is located near to the city. The news agency is one of the largest in Turkey and possesses a fleet of SNG satellite trucks as well as live broadcast studios.